If you have music and haven’t uploaded it onto Soundcloud yet, you’re missing a trick. This online music platform has been around for the past decade and still remains one of the strongest music hosting sites, with 175 million unique listeners per month. While similar platforms, such as Spotify, Pandora and Apple Music, are also worth exploring, Soundcloud is the best starting point as its primary goal is to help up-and-coming artists reach the masses. To maximise your chances of getting heard, make sure you are taking advantage of Soundcloud’s tagging system so that your songs can be easily found. 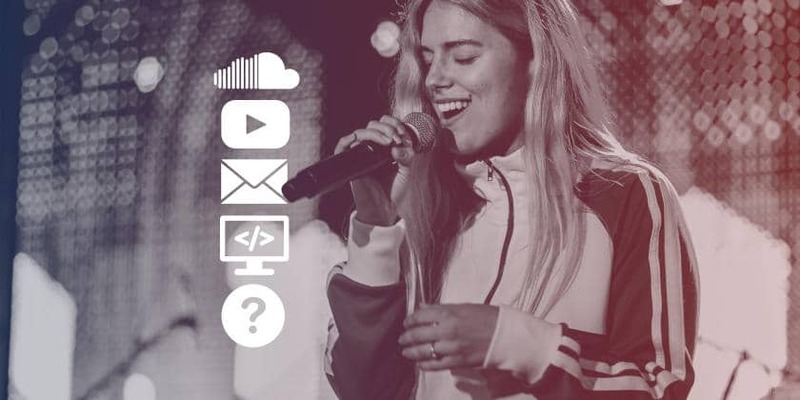 A key mistake many musicians make is that they simply use Soundcloud to upload their music and neglect to fill in their profile or engage with site visitors. To stand out, ensure that you interact with the Soundcloud community as you would on Facebook: respond to all comments on your tracks and encourage them to check out your website. Useful tips for Soundcloud can be found on their Creator Guide. This may seem like a no-brainer, but many artists neglect their YouTube — not updating it regularly or ensuring that they post high-quality videos. With its viral potential, YouTube is immensely powerful in connecting you with the outside world. Remember that artists like Justin Bieber and Carly Rae Jepsen were discovered through this platform. It may seem like a lot of competition, but as long as you are disciplined, posting your videos a few times a week, you will gain a following. Starting a vlog where you share your songwriting journey with your audience can also help you draw in more viewers. As your channel grows, you even have the chance of earning money from your videos. #3 Blog… or be blogged about! Blogs are a effective way to increase your credibility as an artist and a music blog can become a powerful vessel to organically grow your following and promote your music in an authentic way – but be warned, this requires a lot of dedication and time. Another, more short term, route to gaining both credibility and exposure is to collaborate with existing bloggers and get your music featured on their site. To achieve this, make a list of music bloggers that are interested in similar genres or that shine a spotlight on newcomers in the music industry. Introduce yourself and make sure you personalise your request for each blogger, as you would with venue bookers and gig promoters: read up on their previous articles to gain an understanding of what they like to write about and try to tailor your email. There are platforms you can use that have already done the research for you, like Hype Machine, which contains an extensive list of over 700 carefully selected music blogs. This is not only a great research tool – if you manage to get your music featured on any of the listed sites, you’ll be searchable on Hype Machine’s website, which has over 25,000 followers, a portion of whom will undoubtedly be involved in the music industry. Learn more about getting your music featured on music blogs. Email may sound old-school, but it still remains one of the most likely ways to get your content read. A great way to collect email addresses is directly through your website by installing a sign-up form. To compile lists and send out emails, we recommend using MailChimp, arguably one of the easiest tools for musicians to market themselves. The free version allows you to send up to 12,000 emails a month to 2,000 or fewer email addresses. The platform is intuitive and doesn’t require you to have any prior web design or coding experience and allows you to create attractive emails with a simple drag-and-drop system. Social media marketing increasingly revolves around videos. Live streaming is an important element of this and has grown enormously in popularity and reach potential. As a musician, this is fantastic news as you can simply record yourself playing a song and stream this directly onto streaming platforms like Facebook Live or Youtube Live. To target a broader audience, you can also experiment with platforms like Periscope, YouNow (make sure you use the hashtag #musicians) and StageIt. Have we missed anything? How do you promote yourself online? What advice do you have for other musicians? We would love to hear about your experiences in the comments.